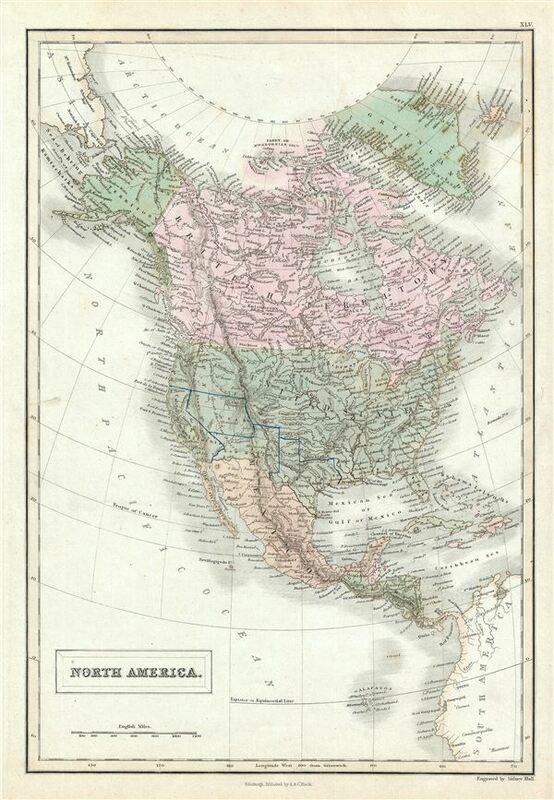 This is a fine example of Adam and Charles Black's 1851 map of North America. The map covers the continent of North America from the North Georgian Islands in the Arctic Ocean to the Galapagos Islands, including the United States, Canada, Mexico, the West Indies, and Central America. It also includes Greenland and Iceland. Upper California, Utah and New Mexico and Texas, although the same color as the rest of the United States is surrounded by a blue border, likely intended to communicate its transfer to the United States following the 1848 Treaty of Guadeloupe-Hidalgo, though such is not specifically noted anywhere on the map. Various cities, towns, rivers, mountains and several other topographical details are noted with relief shown in hachures. This map was engraved by Sidney Hall and issued as plate no. XLV in the 1851 edition of Black's General Atlas of the World. Rumsey 2305.052 (1854 edition). Philips (atlases) 4334.